The Bali 6ft Super King Size Zip and Link Bed with Orthopaedic Mattresses is a luxurious and comfortable hand tufted and generously upholstered bed with multiple layers of orthopaedic fillings. Mattress border and divan base are upholstered in luxury Stone Faux Suede fabric. It is available with a Platform top Base for firmer support or a Sprung Base for a softer more luxurious feel. The divan base is made from solid timber to provide a comfortable, sturdy, sleeping platform.The divan base comes with easy glide castors. Base comes in 2 section with castors and attachments for the headboard. 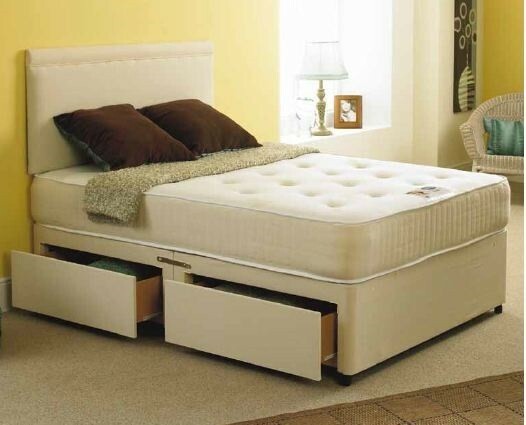 The Bali is a high quality divan bed and a superb example of craftsmanship at an affordable price.